The first nine holes of the new Sutton-in-Ashfield Golf Club as it was initially titled, were laid out on some of the highest and most exposed land in the county, by Mr Tunbridge, the professional at Mansfield. The ground was leased from the Duke of Portland. The Duke's agreement to lease the land for the use of the new golf club included one firm stipulation: No-one was allowed to play the game before 1pm on a Sunday afternoon. Before then, his Grace had ruled, all good people - including golfers - should be in church! It was also ruled that there should be no caddies at Coxmoor, although no explanation for this rule appears to have been recorded. The Duke, a keen hunter, also retained the shooting rights on the land and in later years, long-serving professional Bill White can recall walking the course while his Grace wielded a double-barrelled shotgun instead of a mashie niblick. In those days, Coxmoor Road was nothing more than a country cart track which had earned the reputation as a Lovers Lane, so popular was it with courting couples from Sutton. The lane was lined on one side by gorse bushes and, of course, did not enjoy the modern advantages of street lighting. It was not until the late 1930s that a tarmac surface was laid for motorised transport. Players came from as far afield as Nottingham and Hucknall to join the new club, travelling to Sutton Junction by train, then facing a walk of just under a mile from the station. A select few were able to make the journey by car and some even cycled the 16-odd miles, making use of the bike sheds provided by the club. It is worth considering that there was no thing nine holes at Coxmoor in those days. Because of the length of time it took to travel, nine holes involved a day out, emphasising the dedication and love of the game showed by those pioneers. The original first hole ran alongside Coxmoor Road, between the road and what is now the seventh green towards the present 13th tee. All nine holes were laid out on an area to the west of the current clubhouse as far as the boundary of the observatory and north to a boundary cutting across the eighth and 12th fairways of the present course. So, as World war One loomed ever closer across the Channel, Sutton opened its course. With a little imagination you can conjure up a picture of the new golfers of Coxmoor, led by the good Reverend Shelmerdine, teeing it up for the first time, dressed in their woollen plus fours, starched collar and tie, flat caps, on that windswept, treeless course. How fascinating it would be to find some early scorecards! Having established a nine hole course on which to play, the committee now turned its attention to providing a clubhouse to complement it. The inspiration for the course had come from the nearby Mansfield and Hollinwell clubs, established many years before Coxmoor's appearance. Perhaps our club's founders had dreams of a clubhouse to match their illustrious near-neighbours - but such lofty ideals were not so easily fulfilled in those early days. Possibly because of the club's finances, or the pressure of time, or more likely because they did not think it would be worth building an extensive clubhouse on what was leased land - the reason is not recorded - the Coxmoor pioneers had to settle for something a little more humble. From somewhere in Sutton, they acquired an unwanted corrugated iron and wooden chapel building, no doubt with Rev Shelmerdine's assistance. It was transported up the hill to Coxmoor and the members erected it on a site near the 13th tee. The primitive structure - described somewhat grandly as a commodious building - was said to be freezing in winter, stifling in summer and possessed few of the creature comforts we all take for granted today. But it would serve its purpose for the best part of 50 years. The first competition of note to be introduced at the new club came in 1919 when the Duke of Portland donated a trophy. It is worthy of note that in that same year, 1919, Mr Ronald Coupe was appointed as the club's auditor. He would remain a loyal servant to the club for many years. 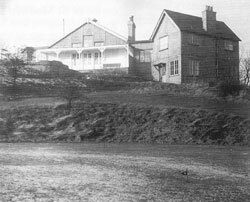 The Sutton-in-Ashfield Golf Club, as it was still known in those early years, flourished from the start and soon began to outgrow its modest accommodation. The initial membership had grown to 180 by 1921. On January 1st, 1921, a special meeting was convened by the club committee to discuss an extension to the pavilion. Tenders were invited and a Mr Harvey was given the contract for the work. The committee also gave the go-ahead for ladies and gents changing rooms to be added, together with a small kitchen facility at the rear. The committee also decided to indulge in the luxury of a verandah so that the members could enjoy sunny afternoons watching players finishing on the ninth hole. It should be remembered of course, that they did not have the facilities of a well stocked bar and the waitress service which the members enjoy today. In the early days before Len White became the first professional - as well as greenkeeper and steward - the grandmother of current member and former captain of the club, Elam Dudley, who lived in the White House on Coxmoor Road, used to come up every Saturday to provide the members with tea and cakes. In the gents dressing room, there would be a few tables, a crate of beer, some bottles of spirits and a bottle of pop - all paid for by the use of an honesty pot. After a keenly fought round of golf, the members would play cards with various forms of whist and also games of KoonKan among the favourites. It is fair to say that things were put on a more professional footing when Len White and his wife Sarah took over the stewardship of the club - takings rose by around 400%! That same meeting of January 1st, 1921, also passed a proposal to extend the last four holes, bringing the total cost of clubhouse and course work to £800, which was to be raised by subscriptions and a debenture share scheme, bearing 6% interest. The committee also decided that the club should become a limited company, giving every member a £1 share, with seven directors and a share capital of £500. Thus it was that on January 1st, 1921, Coxmoor Golf Club Ltd finally became a reality. At some stage in those early, formative years, a country membership was introduced. Bill White remembers a map being hung on the wall of the old clubhouse. A circular line marked a seven-mile radius. Anyone living beyond the line was eligible for country membership at a reduced fee. He recalls an uneasy relationship between country members and the local contingent. "The country members used to cause problems on a Sunday. The first point of the course they reached, coming from Nottingham or Hucknall, would be the corner where the sixth tee now stands. At that time, it was the fourth and they would often come through a gate by the tee and start playing from there. "Members who had started on the first would catch them up and arguments would break out," said Bill. In an effort to avoid these unfortunate confrontations, country membership was limited by the committee to 60. Bill also recalls another problem arose from the fact that the course was crossed by two public footpaths. "Kids used to walk on the course and pick up golf balls, even when they were being played with. "I once chased one all the way to Sutton Junction to get a ball back." During the passage of 1921, the club held its first dance, a popular and well supported event by all accounts, and junior membership was introduced, laying the foundations for the fine crop of young players that would emerge at Coxmoor over the ensuing decades. Bill recalls that in later years, the Coxmoor annual ball, which was held at the Regency Ballroom in the centre of Sutton, was one of the most glittering occasions on the town's social calendar with tickets coveted like gold dust. 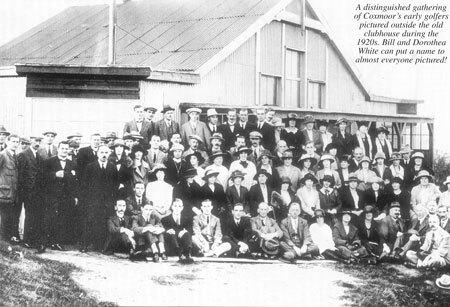 The growth of Coxmoor continued to gather pace and in 1923, at the tenth annual general meeting, again held in the Bainbridge Institute in Sutton, the question of a full-time club professional was debated. It would seem that prior to that date, the duties of course maintenance and care of the pavilion had been in the hands of Mr Edward (Ted) Woodward, a former cricket umpire. The absence of his name from the club accounts for those early years would suggest that he took on these important duties in an entirely voluntary and unpaid capacity. The fact that Mr Woodward, as early as the second AGM in December 1914, had been made an honorary member would seem to confirm this. Bill White can remember Mr Woodward in his 70s, as a tall, white-haired, quietly spoken gentleman with a bushy white moustache, tinged with the colour of a heavy smoker. Up until the 1930s, according to Bill White, Mr Woodward and a friend named Hadfield, would often been seen around the course, bright and early on a Saturday morning, hunting for rabbits. A distinguished gathering of Coxmoor's early golfers pictured outside the old clubhouse during the 1920s. Bill and Dorothea White can put a name to almost everyone pictured!